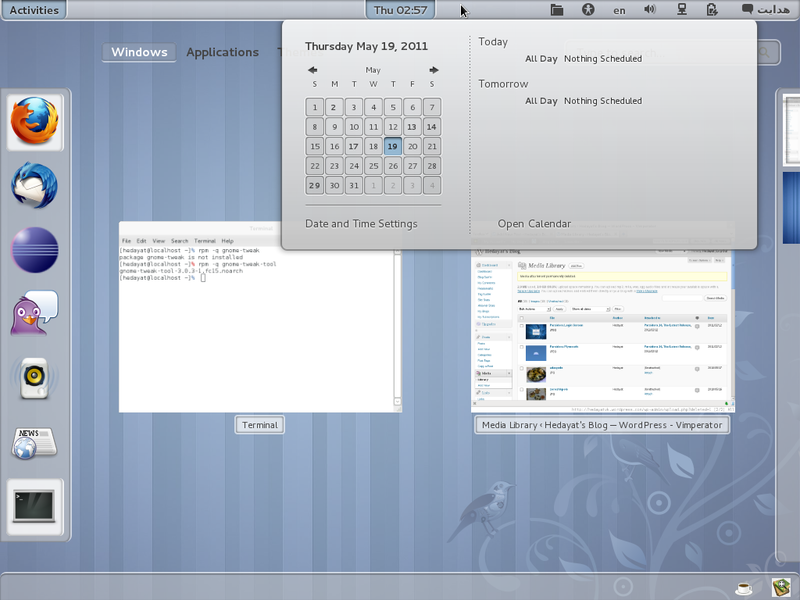 Today, it become clear that Fedora 15 will be released on May 24th :). It is an interesting release, specially as the first official Linux distribution coming with GNOME 3. Besides, it comes with a number of interesting features including (but not limited to): KDE 4.6, systemd, power management enhancements, Robotics Suite, Retrace Server, Better SPICE support, Dynamic Firewall and GDB 7.3. You can find the complete list of new features at Fedora 15’s Feature Page. I have tried Fedora 15 since its Alpha release, and started using more seriously since the first test compose of the final release. I generally really like this release, however it has a number of issues too because of the arrival of the new GNOME 3. Let’s start with the annoying parts first! I have already talked about some GNOME 3 design decisions that I don’t like. I use my laptop as a “computer”, and its main job is … computing rather than being an interactive device! So, when I close its lid I don’t want all my downloads or processes to be stopped; and I know that there are many like me. Fortunately, you can install gnome-tweak-tool to be able to easily change this setting. Except the tray icons of Java applications which float around in GNOME 3, almost everything is fine with it … as while as I use en_US locale. As soon as I switch to fa_IR locale, problems appear: simply, gnome-shell crashes immediately! Using one of two available workarounds, I can actually login to gnome-shell. Then, a number of issues appear, with the third one being so problematic that makes gnome-shell in fa_IR locale almost unusable and forced me to switch to en_US locate for the time being. OK, these were all that really hit me with this release. It’s probably not that bad for such a release with big changes! 🙂 However, we will probably delay our Parsidora 15 release until some of all of these issues are solved. I have installed some gnome-shell extensions and gnome-shell themes to customize it a little (while the default gnome-shell theme is also beautiful). Also, since GNOME 3 doesn’t provide “Type Break” settings in its keyboard preferences anymore, I installed DrWritght which is the same application provided for GNOME 3. As said earlier, gnome-tweak-tool also provides some useful features :). Anyway, as I consider the current version to be usable, I created a repository for it which is available here so that updates can be delivered automatically. All you need to do is to add its .repo file to your /etc/yum.repos.d/ directory. Please let me know if encountered any problems.